My husband and I were lucky enough to go to Maine for a week for a family reunion at Great Moose Lake. We also got to hop around Portland, Bangor and Bar Harbor. The scenery, ocean air and time with family was wonderful, but of course we always use vacation as an excuse to eat our faces off. We ate three lobster rolls in five days but whose counting? As always, major thanks to patient Dave for letting me snap pictures of all the yummy food. XO. First up we went to the Portland Lobster Company based on a wonderful recommendation from my friend Maddi, who knows all things New England. 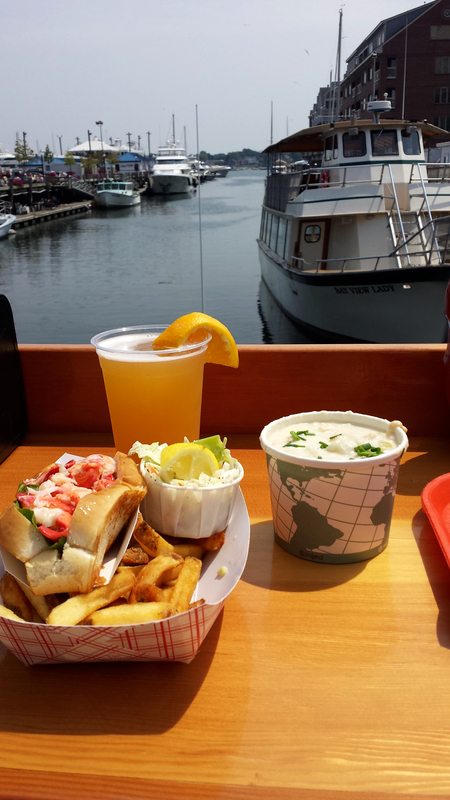 We each ordered a lobster roll and shared a cup of clam chowder and a basket of fried shrimp with a cold, crisp Allagash beer. 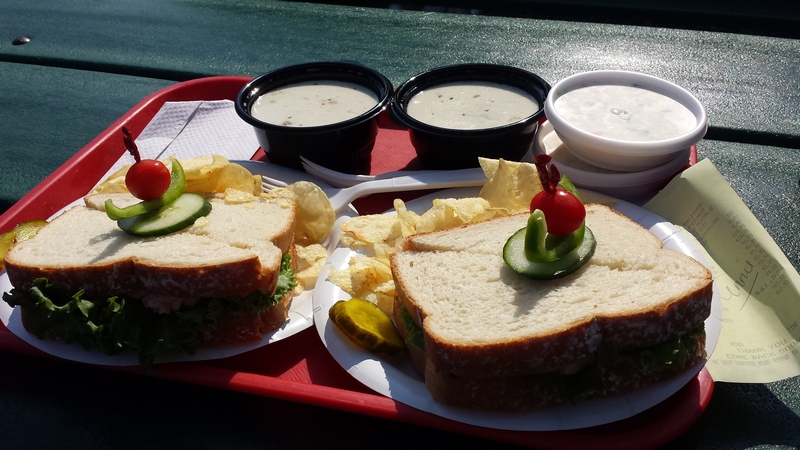 The restaurant is right on the water, so we sat in the sunshine and devoured this insanely amazing lunch with a lovely view. Life totally ruled on this day, my friends. I mean…look at this. The lobster was so fresh with a perfectly light dressing and the roll was so buttery I wanted to order another one as soon as I was done. 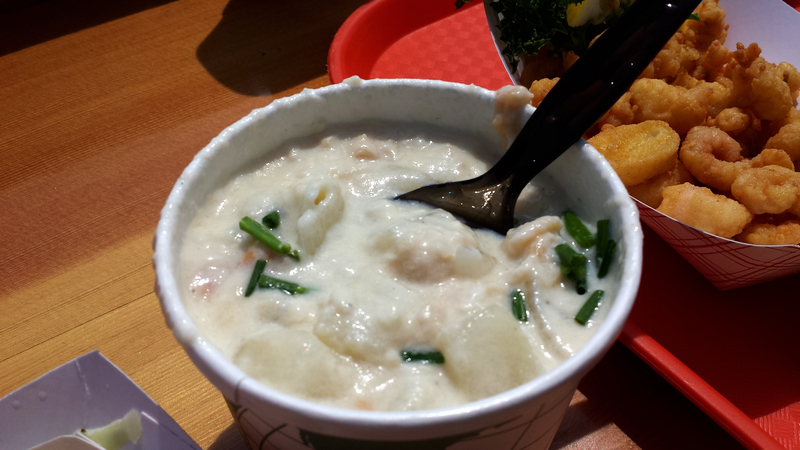 The clam chowder was delicious. It was thick and chunky, just the way I like it and it had just a hint of mysterious smoke from I don’t know what, but I loved it. Every time Dave took a bite I got a little sad I would have one less heaping spoonful, but marriage is about sharing, at least that’s what Dave keeps telling me. Next up in Portland we had read that Slab was a must-have for pizza. Uh, yeah it is! 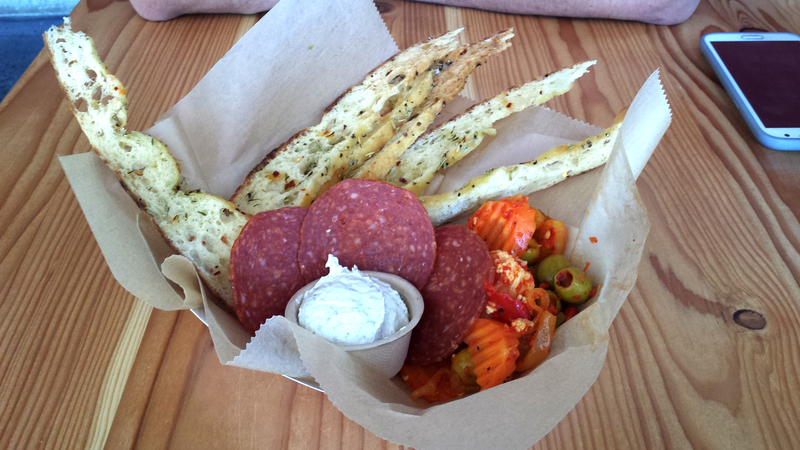 First we ordered the Salumi for an app, which was Sicilian summer sausage, creamed herb orange black pepper sheep’s milk cheese spread, muffuletta relish and bread crisps. The muffuletta was so good – spicy and tangy and a perfect complement to the black pepper cheese spread, which I could have eaten a bucket of. Next, I did something weird. I ordered the Spicy Bean Wedge piece of pizza. It had cannelini beans, giardiniera and cheese. Holy hell, if this wasn’t one of the best pieces of pizza I’ve ever eaten. The crust was unlike anything I’ve had before, it was extremely thick but still really light and fluffy. 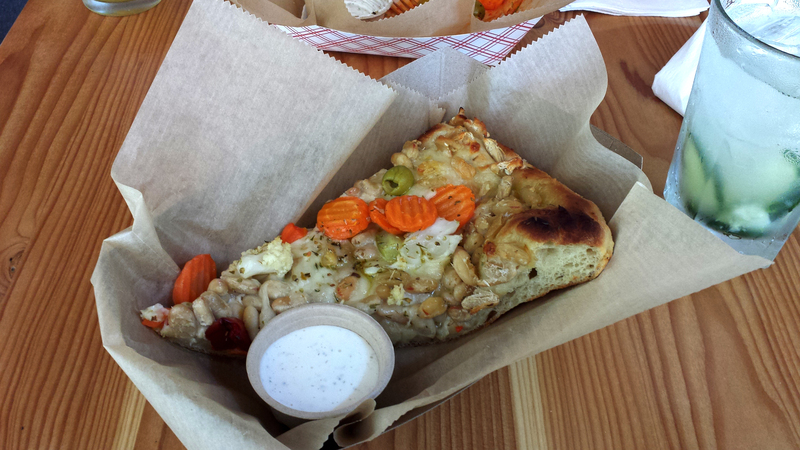 The beans on the pizza made the texture buttery, creamy and delicious – with the heat from the giardiniera – perfection. OH! And that dipping sauce was ranch, unbelievably tasty and will now be my new go-to for all things pizza. 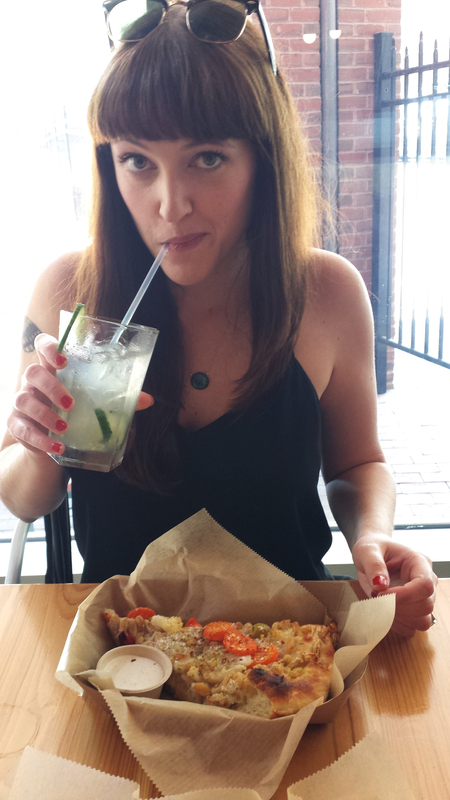 I was a happy camper – especially with my afternoon cucumber cocktail. 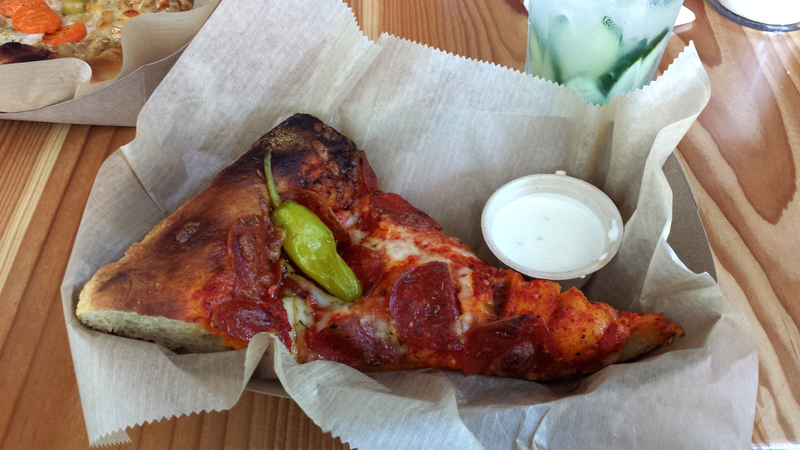 Dave ordered the Spicy Meat Wedge, of course, which had pepperoni, pepperocini, ajvar pepper paste and cheese. The tiny bite he let me have was heavenly. 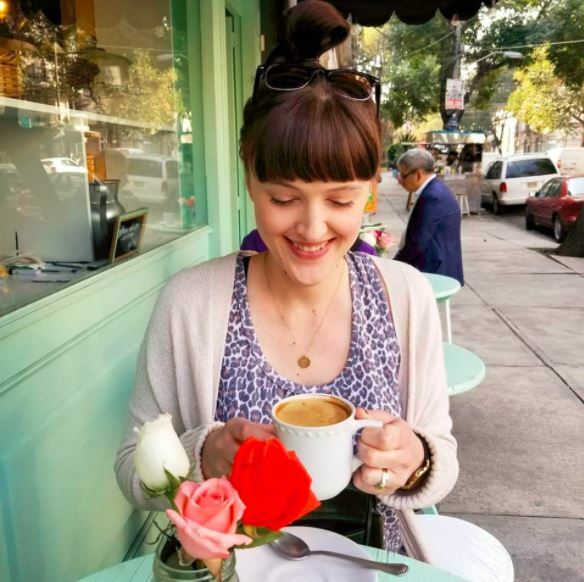 Our last eating-fest in Portland was at Eventide Oyster Co.. It’s a tiny, charming restaurant that I already can’t wait to go back to. I ordered a delicious extra dirty olive martini that had oyster brine in it that was out of this world – no picture because we both sipped it too fast! 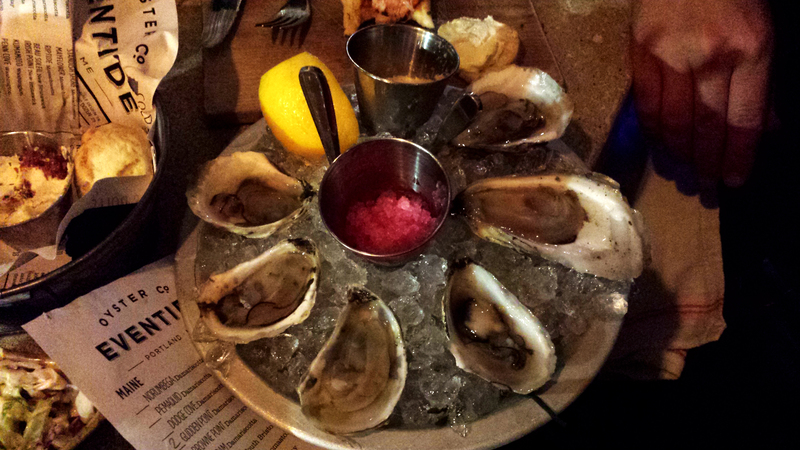 Typically I’m not in love with Oysters, but look at how fresh and beautiful these little guys were! 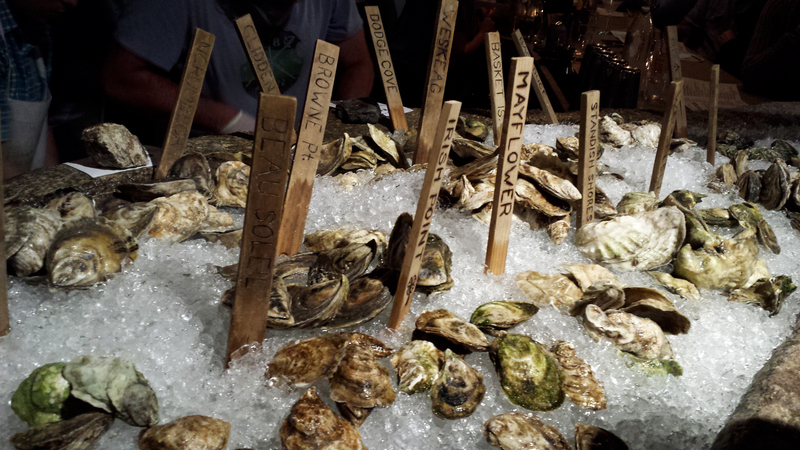 So we had to order some oysters. 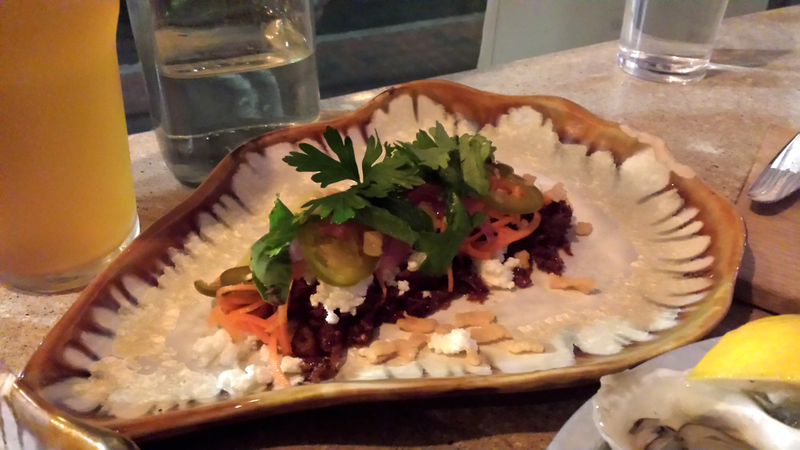 Ours came with red onion ice and horseradish sauce. Even though I only had one (yep, Dave ate all the rest) it was tasty, so much so, that I might even put my dislike of oysters on hold. We also ordered the Crispy Pork because eating seafood for days had us low on our pig intake. 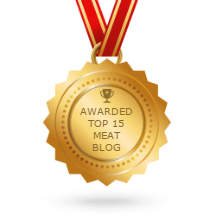 It was really flavorful and smoky. 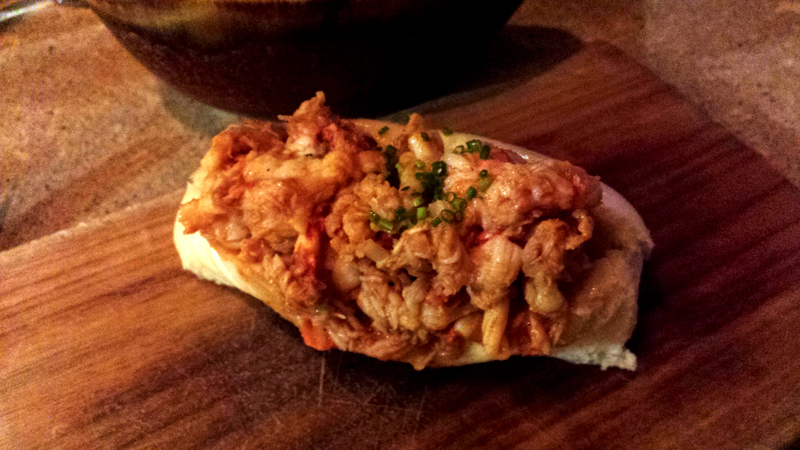 Then, drum roll please, we each had a lobster roll with BROWN BUTTER. It was served on a small bun, that was similar to a Korean steamed bun. 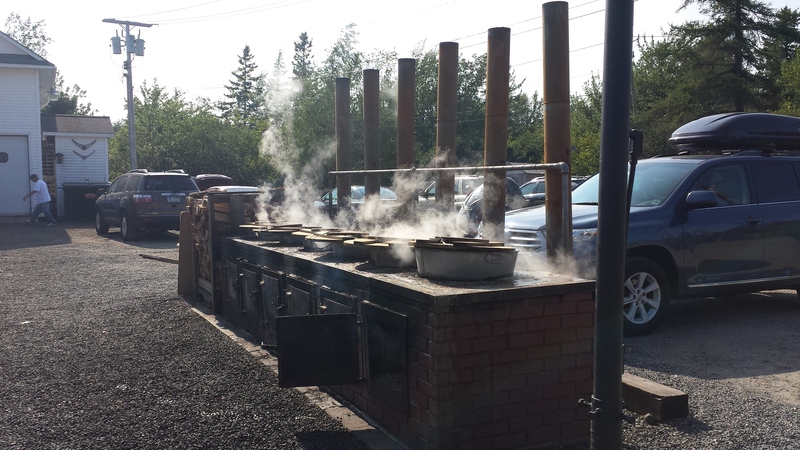 It was the perfect delivery system for this ah-mazing lobster. It’d be a sin to visit Portland and not try this epic roll. 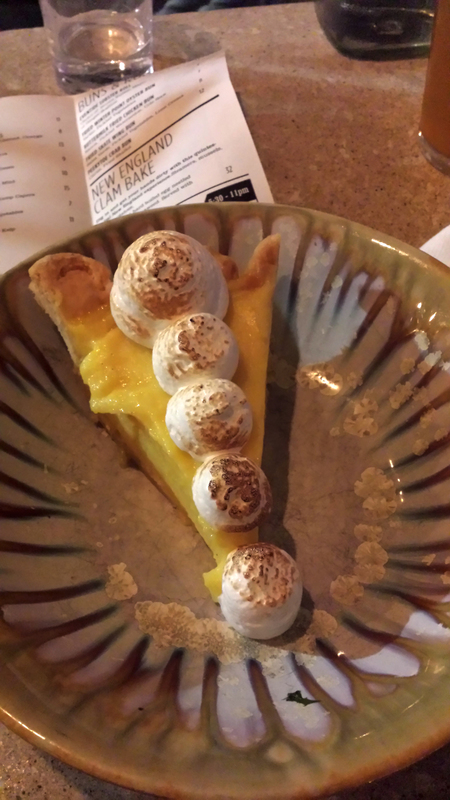 To round out this perfect meal I ordered the lemon meringue pie which was tart and creamy…mmmmmmm. 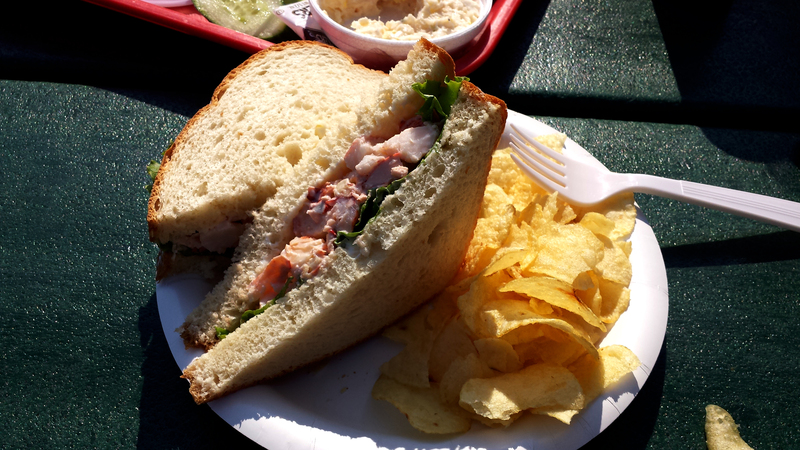 Alright, I’m almost embarrassed to show you yet another lobster roll but alas, I must. 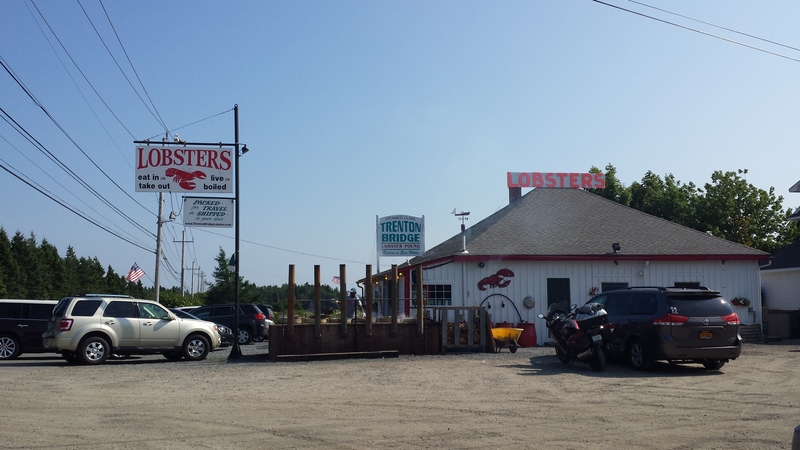 We got a great recommendation to try Trenton Bridge Lobster Pound right outside of Bar Harbor. 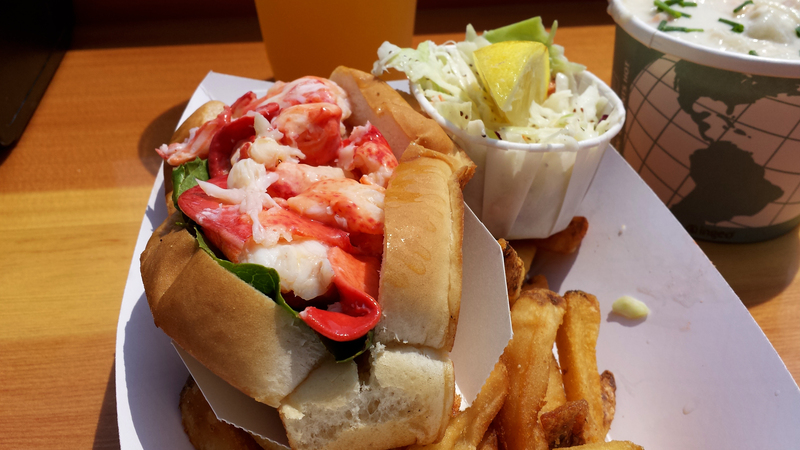 While this might not be the fanciest looking lobster roll in town, the flavor was unbelievable as the lobster is boiled in sea water right outside so it is so freaking tender. I savored every bite. Alright folks, that’s it! 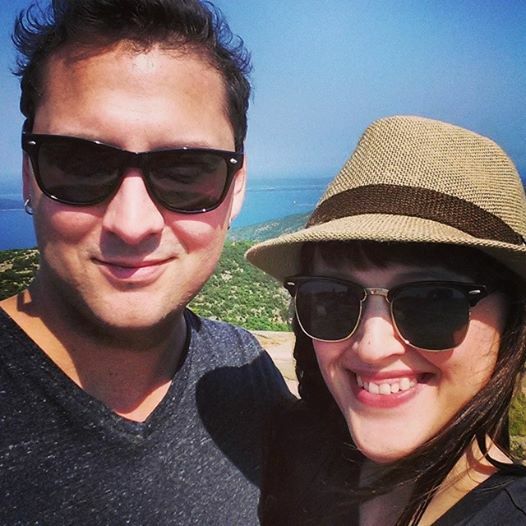 We had so much fun eating all of the sea – now back to burgers, pork and meatloaf. Cheers!